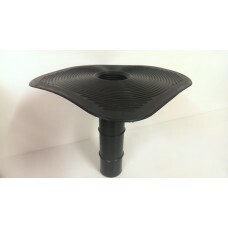 EPDM Drain Outlets are used to connect EPDM membrane to rain water drains. The slightly conical shape enables fast and simple installation in rain water drains. The roof outlet has a smooth flange to improve adhesion to the EPDM membranes and has two rings on the shank which act as a drain trap between the outlet and the rain water drain. The resilience of the material used in its construction guarentees a long term seal. The shank in the upper section has a series of internal serrations which ensure that the leaf-excluder or gravel-excluder is fixed tightly to the connector. Resistant to deterioration by the sun, ozone and other agents or chemicals normally found in the atmosphere. They have excellent flexibility even at low temperatures. The mechanical properties are maintained in the long term.